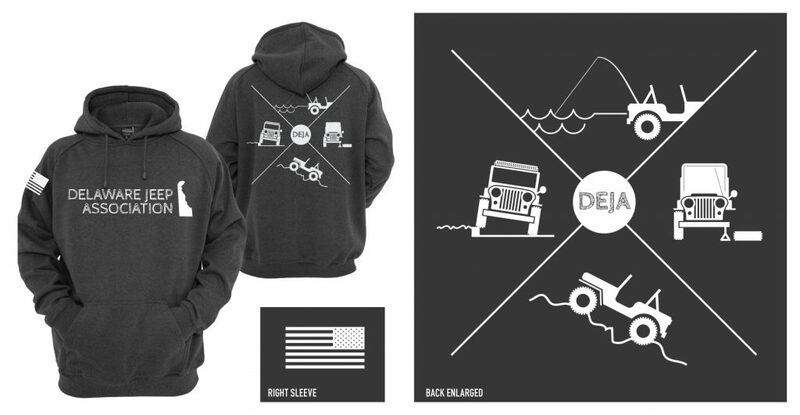 I'm really happy to announce the new DEJA hoodies are now available to be ordered. We spent a bunch of time on this and I think they are really cool. Special thanks to Mark Rutt (facebook.com/MarkRuttArt/) for doing the custom artwork created just for us. Mark has done a lot of work for Jeeps for Joy recently. There's two options here...one for a pick up and one to have it shipped to you. Hoodies will be available to be picked up at the 11/12 meeting and they can be picked up at my house in Newark or Hagar the Horrible's in Townsend. Note that doesn't mean I will drive it your house. We will also have it shipped to your house for an additional $6. Cutoff for orders is mid-dayish on 10/27. Ordering early will help us plan quantities better. We're going to order a few extra as giveaways and for cash purchases at meetings but it won't be a ton so if you want one please order. Oh, btw, these are the "tailgate" hoodies with an integrated "beverage" holder and bottle opener. The post was edited 1 time, last by Stafford ( Oct 11th 2016, 2:36pm ). Ordered mine! I got an XL, any idea if they run bigger or smaller? No idea to be honest. It's a 9oz 60/40 cotton/poly blend. Haven't seen it in person but I believe it's a higher quality hoodie than the blue ones (on top of the awesome bottle opener and pouch). Is this going to be a one time limited run? For this specific hoodie order it will be a limited time. If you want one you'll need to order now. We own the artwork so we can do more (don't be surprised if tshirts happen in the spring) but this is a one time run. If we did one offs after this run the cost would probably be significantly higher. So like Matt said, order now. Part of the reason for making it a one time run is that we don't want to sit on a ton of inventory. The old old tshirts sat around for years and we ended up giving the last of them away for next to nothing. Teespring and limited run orders like this are much easier to manage. I edited the OP and title to reflect the order cut off as 10/27. If there is one, I will take. Checking on the tall option, you guys are a bunch of needy princesses. We will have them in hand before the 11/12 meeting, not sure if we're going to ship to me or Joel so I may not have them until the 12th. TBD. If XLT is an option, can my order be adjusted? Yeah, what Steve said... I don't want to put in an order now and then have y'all hassle with an adjustment to the order. I ordered mine. Let me know when they come in so I can pick it up. I'm looking at getting two of them, but holding out for an update on the possibility of a Tall variation. Steve - I have a tailgate hoodie (it's one of my favorites) and it seems to be sized correctly. Body width is the width of the garment, not the circumference. To find the circumference, take the body width measurement and double it. For example, the XL hoodie has a circumference is 51 inches. If your waist &/or chest is less than 51 inches around, it will fit.